Legendary Detroit activist, now 99 years old, needs your help. 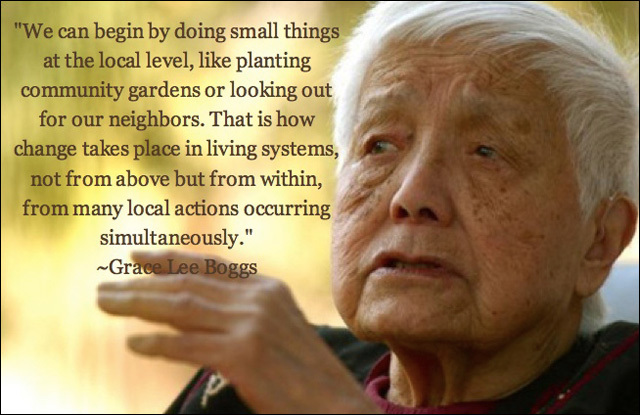 As you may be aware, activist/philosopher/author Grace Lee Boggs, now 99 years old, is in ailing health and in hospice care at her home in Detroit. With over 75 years of work in the labor, civil rights and Black Power movements, she has lived an extraordinary life of love, struggle and revolution. In September, she released a statement recorded at her bedside, acknowledging the end of her journey. However, it should be no surprise that Grace Lee Boggs is a fighter. Over the last month she has apparently become stronger, and it seems will be with us for much longer. But she will still require 24-hour care. We are writing to ask for your support in keeping Grace Lee Boggs in her home in Detroit as she makes her final transition. As you are well aware, Grace is now 99, and has devoted her life to the struggle to stretch our humanity. Like her partner Jimmy Boggs, she has done so with minimal regard for personal advancement or riches. Grace has been living on a fixed income for quite some time. Grace has always put the needs of others before her own. But now she is in need of your support. In September 2014, Grace went into hospice care. Over the last month she has become stronger, and it seems will be with us for much longer. She has been welcoming old friends and keeping up on world events. Still, she requires 24-hour care. As you might know, there is very little public support for quality care to keep our elders in their homes. Grace’s resources are nearly depleted and those of us around her are limited in how much financial support we can all provide. Her care costs $8,000 per month. This is frankly more money than we have ever raised. So we are making this appeal for assistance to raise these vital funds. Grace has established a Trust to which you can contribute directly. The funds from this page will go directly to the trust. Because we expect that Grace may very well celebrate her 100 birthday with us, we envision a sustained responsibility. If you are able to commit to a monthly contribution, please select that option when you donate. We also know that many people around the country have been sending energy, light and prayers to Grace and holding small gatherings in her honor. We encourage you to reach out to your community and host a fundraising event. We will post the results of our efforts on the Boggs Center website and on Facebook. All of the contributions will go directly to Grace’s care. Please note these contributions are NOT tax deductible. Any funds in Grace's trust account at the time of her passing, will be placed in a non-profit, the James and Grace Lee Boggs Trust. We deeply appreciate all the warmth and thoughtfulness sent to Grace during this time.